Reverend Adam Janes was called to be our pastor in July 2016. Born in Coos Bay, OR, he was raised on a dairy farm in Tillamook and later lived in Salem where he graduated from high school. Adam is a 2000 graduate of Northwest Christian College (now Northwest Christian University) with a degree in music ministry. It was during his time at NCC that he met and married his lovely wife, Tina, in August of 1999. 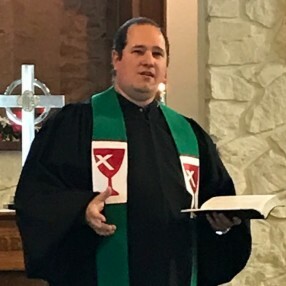 After serving as a youth minister at First Christian Church in Hermiston, he began seminary at George Fox Evangelical Seminary and then transferred to Emmanuel School of Religion (now Emmanuel Christian Seminary at Milligan) in Johnson City, TN where he earned his MDiv. with an emphasis in Christian Care and Counseling. He completed a unit of Clinical Pastoral Education at Johnson City Medical Center. He has also completed training in suicide intervention. Adam has served churches in Keizer, Eugene, and Hermiston, OR as well as Weber City, VA and Rogersville, and Dover, TN. He worked for a year as an independent contractor providing in-home counseling services for the Tennessee Department of Children's services. Adam and Tina have three wonderful boys who keep them busy with band and sports. The entire family is musically talented and enjoy playing together at church and in the Othello Ecumenical Ensemble. Message from Our Pastor: I am so grateful to be able to serve as the pastor of Othello Christian Church. It is a privilege to work alongside so many faithful people willing to take risks for the sake of the gospel of Christ. My family and I love this area and look forward to the future we have together.